Eight people were killed, and at least eight others injured after a 10-wheeler truck slammed head-on into an oncoming passenger jeepney in the town Barotac Nuevo on Wednesday. All those killed in the accident were onboard the jeepney – the force of the impact threw the victims out of the vehicle and scattered them along the highway. Police said those killed ranged in age from just four to 48. The driver of the jeepney was among the dead. 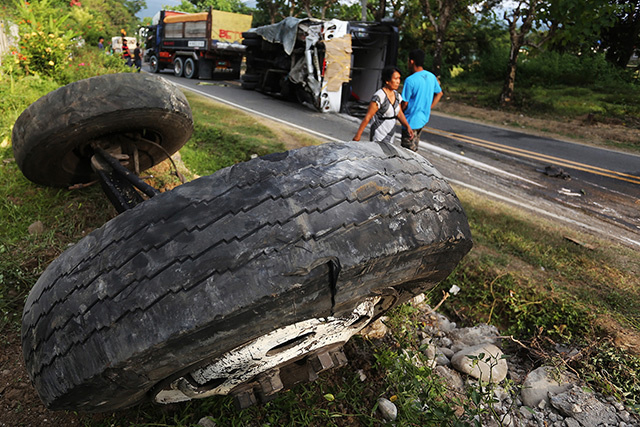 An investigation into the accident showed the truck was headed to the town of Barotac Nuevo and originating from the town of Anllao. Eyewitnesses said the truck attempted to overtake a passenger bus but failed to return to it lane, slamming the jeepney head-on. Both the driver and the helper inside the truck were injured, the driver suffered a broken leg. The truck driver has been placed under arrest for his actions. He is now being held at the Western Visayas Medical Centre in Iloilo City where most of the injured were taken.